Demonstrates an active learning technique to learn handwritten digits using label propagation. We start by training a label propagation model with only 10 labeled points, then we select the top five most uncertain points to label. Next, we train with 15 labeled points (original 10 + 5 new ones). 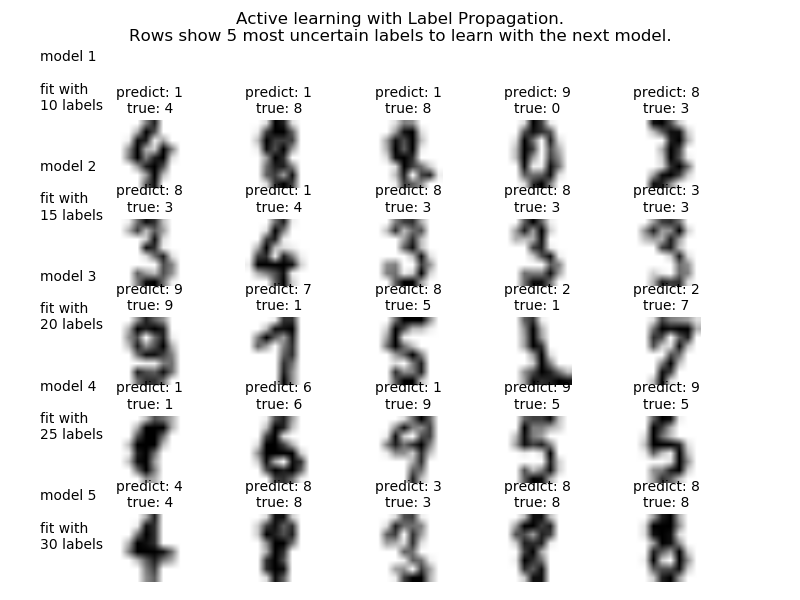 We repeat this process four times to have a model trained with 30 labeled examples. A plot will appear showing the top 5 most uncertain digits for each iteration of training. These may or may not contain mistakes, but we will train the next model with their true labels. print("Label Spreading model: %d labeled & %d unlabeled (%d total)"
f.suptitle("Active learning with Label Propagation.\nRows show 5 most "